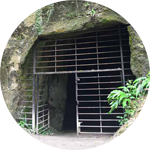 The caves are open every day at 10:00am until Wed 31st October 2019. Today's Tours Start at 10:30, 11:30, 12:30, 13:30, 14:30 and 15:30. N.B. In exceptional circumstances Tour times may vary. Normally Open daily at 10.00am from 6th April until the end of October. Tours are every hour on the half hour e.g. 10.30am, 11.30am - Last tour 3.30pm except local Summer holidays (20/7/19 - 31/8/19) then the last tour is 4:30pm. 1st - 18th and 28th - 31st: 10.30am, 12.30pm & 2.30pm. 19th to 27th as March to September with the last tour at 3.30pm. Child 5 to 16 years and over 65 years £7.00. Family 2 adults + 2 Children £28.80. Our guides will take you on an hour long tour through the vast man-made complex of underground caverns with their mighty halls of vaulted roofs and pillars of Beer Stone which have been likened to a vast underground cathedral. See for yourself the methods used to quarry and deliver the huge blocks of stone, the working conditions, the hardships endured and the dangers faced daily by the work-force using only the light from a flickering tallow candle and you may never again see a famous building with the same eyes. The caves are cool so please bring warm clothing and it’s best to arrive at least 10 mins before the tours start. Many of us marvel at the intricacy of stonemasons' work on numerous stately buildings, cathedrals and churches. But do we ever stop to consider where the stone came from and the history of the excavation behind it? This vast man-made complex of underground caverns was created by centuries of quarrying the famous Beer Stone. 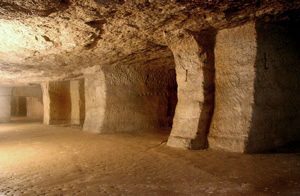 The underground quarry, first worked by the Romans, supplied stone for 24 cathedrals including Exeter and St.Paul's, parts of Westminster Abbey,the Tower of London, Hampton Court and Windsor Castle. Quarried by hand, a small block weighing 4 tons, the stone was carted on horse-drawn wagons and by barges from Beer beach to its destination, sometimes involving journeys of several hundreds of miles. The quarry closed around 1920 as a new quarry opposite was opened. This closed in 2003, so there is no quarrying activity now. Only assistance dogs are permitted underground. Light refreshments and souvenirs available. From Wed 1st to Sat 18th May (Not Sat 11th) – Four of Swords Theatre Present “Oedipus”. Tickets are ONLY be available through the Four Of Swords Website (Opens in new window). See Events page for future events i.e. Bats Study on Fri May 31st; Candlelit Evening Tours on Fri July 19th. This is an inspirational and moving place, inspiring awe at the extraordinary skill and industry of man throughout 2,000 years and moving because of its testament to the injustices of a system that enabled such labour to be valued so lightly – a must see destination and many congratulations on the best guided tour I have ever had. Tim Smit – Director , Eden Project, Bodelva, Cornwall. Very interesting and also very moving. Three visits and just as fascinating as the first visit. Learn something new every time so worth more visits. Thanks. Wow! Nothing like this at home. The guide was brilliant and made it so real. Aukland New Zealand – 15/08/2018. What an incredible place, unique with so much history. A place not to be missed – must be seen to be believed. Many thanks. Fantastic, reality tour, so much interesting information told with humour. Fantastic, amazing, emotional piece of history. Fantastic tour, very informative. Wanted to visit for the last 30 years, finally made it and well worth it. Thanks you to the lovely staff for making us feel so welcome. Absolutely fantastic – “A Gem that needs more publicity”. A truly historical heritage site that needs to be protected for future generations. One of the most important industrial sites in the British Isles. Beer Quarry Caves are owned by Clinton Devon Estates and leased to the Beer Quarry Caves Ltd.